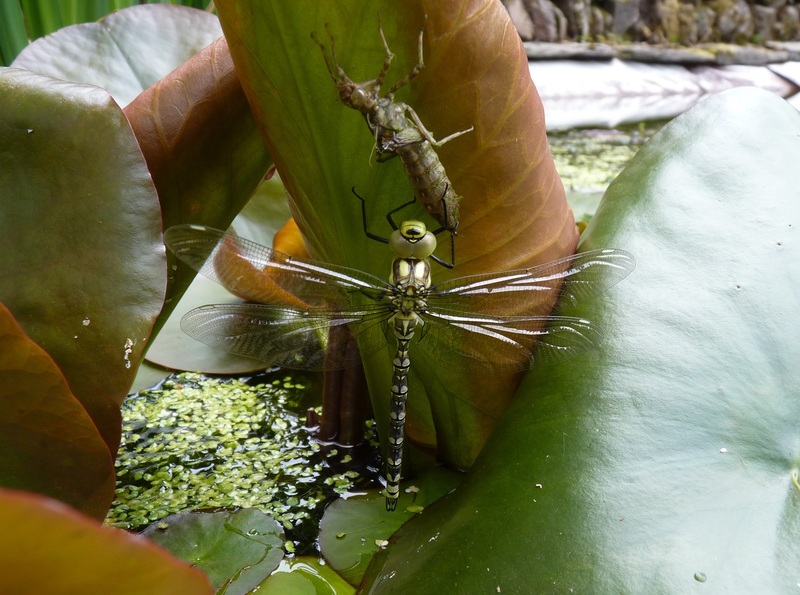 As promised here is a picture of one of yesterday’s dragonflies in all its newly emerged glory. It is yet to make its maiden flight, holding tightly on to all that remains of its subaqua life. I believe this beauty it is a Southern Hawker, an inquisitive creature and common to much of southern and central England. The empty nymph shell is called an exuvia. These facts will undoubtedly impress all your friends, and would make an excellent opening gambit to someone you want to be your friend. Or perhaps not, on reflection it is probably best to stick to talking about the weather. Above all exuvia is a very satisfying word to say out loud. Go on try it, you will thank me. And I thank you for the photo Mr H, your perilous positions were definitely worth it. Quite, it was an education. ps I love Homer, in fact he lives in this house with me! Most amazing! I never saw one in this stage – thanks to Mr.H. And I didn’t know about the exuvia either! Thank you very much. I felt like an idiot saying “exuvia” out loud by myself. You were right. It is a comforting word to say. I will try to fit it into a conversation. Hope you managed it! Such a lovely word. I too am trying to work out how I can slip ‘exuvia’ into the conversation and sound as if I know what I’m talking about, until then I shall merrily chant it to myself as I’m working among the flowers.